The Pacsafe Citysafe CS200 shoulder bag is, quite simply, the best travel purse I've used during my years of exploring the world. 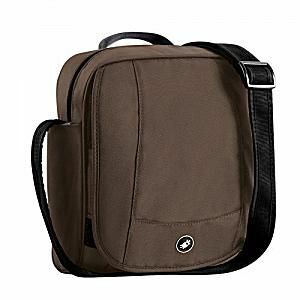 The anti-theft features give me a sense of security on crowded city streets, and the bag's inner pockets keep my passport, credit cards and other important items secure. But, despite having built-in security features designed to thwart would-be thieves, I can still quickly and easily reach everything that I've packed into its various pockets. It holds an amazing amount of "stuff"
Guys can use this bag too! Tough, durable material that doesn't show wear. It only took the first long plane ride with the Pacsafe Citysafe CX shoulder bag to realize that I'd finally found the best travel purse ever. I've used a lot of travel purses throughout the years, but this one is special because it keeps my valuables (passport, credit cards, money, etc.) well away from prying hands, yet holds the incredible amount of stuff most women deem vital for a long trip. For me, the impressive anti-theft features were simply the icing on the cake for what was already a wonderfully designed and organized handbag built specifically with travel in mind. It took a little experimentation to see exactly where things fit best. My passport, credit cards, and iPhone all slid neatly into two padded pockets inside a large zippered organizer that was perfect for holding everything in place. My other "can't loose" items could be safely tucked into other parts of this zippered organizer as well, which is hidden behind the purse's front flap for added security. I placed almost everything else, from my digital camera to a small make-up kit, into the main zippered compartment where they were within easy reach at all times. Tissues, lip balm, and just about everything else I might need went into an outside zippered compartment. After that, there was plenty of room to add an umbrella, small laptop, or even a light jacket. When updating the Citysafe 200 to its latest incarnation, Pacsafe wisely added a water bottle pocket to the design. Previous versions lacked this key feature, forcing travelers to come up with an alternative method for carrying their water. This isn't an issue an more however, as it is easy to access a beverage at all times. Pacsafe, the maker, lists Citysafe as a well-organized urban travel bag, but I've carried it in locales from crowded streets in Rome to the African bush, finding it equally useful in a wide variety of settings. Best of all, after eight hours on a plane floor, it still didn't show any dirt. The anti-theft features on this bag are definitely winners. The shoulder strap has a steel cable and the front and bottom panels are made up of Pacsafe's proprietary eXomesh. This material prevents thieves from racing by and simply slashing the strap or the purse open. A hook on the shoulder strap lets you wrap it securely around a fixture, such as the chair you're sitting on when dining in a streetside cafe. The zippers on the bag can be latched securely on their own or can work in conjunction with a travel lock to provide another layer of security as well. Pacsafe has great travel gear, from hip packs to backpacks, all of which incorporate the company's anti-theft features. For more information, and to check out the company's entire line of travel gear, be sure to visit the Pacsafe website.